Okay guys, so I’ve been back to school for about 8 days and have been through a lot in my first couple days of high school from bad test scores (screw AP Pop Quizzes) and some other stuff… Anyways, since I now know all the ups and downs on a freshman’s official first day and week of high school (or school in general for any grade), so here are my 1st Day of School Tips. My writing may be a little rushed because I’m actually getting new braids, but here are first day and week of school tips. Also, if you’re new to my blog, check out my High School Orientation Tips, Ultimate School Supplies Haul, Checklist, and Shopping Tips posts. This is my fourth post of the NDG School Survival Guide Series, so look out my upcoming what’s in my backpack video on my YouTube channel and stay tune for more posts by following my blog. Also, learn more about me in the recently updated About Page and read below for my post about the first day and week of school. End of School 🏫 and Summer 😎 Preparation: This first set of tips revolves around preparations for high school during your final months of middle school and the summer. Tip 1: Challenges and Expansion – First, when choosing your classes 📝 during your final months of middle school, go for challenging courses instead of the easy A+. This is high school, the time to find who you are, so pick classes and clubs out of comfort zones. Expand your horizons and trust me this will be the beginning of your evolution throughout high school. Tip 2: Choosing Courses – 🙅 Don’t choose classes based on your friends 👭👬. DO WHAT YOU WANT TO DO! Trust me, you’ll regret it, and remember just because you pick the same courses doesn’t mean you’ll be in the class. Tip 3: Electives – Don’t choose your academic classes based on your friends, however if you guys have similar interests ( examples: 🎤, 🎹, 🎮, 🎾, 🎬, 🎨) take the same elective. Sadly, the probability is the bigger the school; the less likely you guys will be in the same class. Tip 4: Orientation – DO NOT, I REPEAT DO NOT, skip out on orientation. 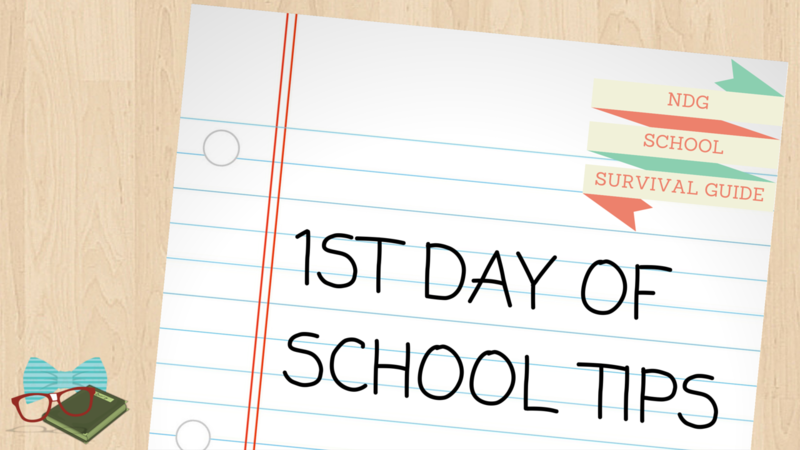 Check out the reasons to go and tips for surviving this special unofficial first day of school at my High School Orientation post. Tip 5: School Supplies – Buy supplies 🎒✏️📓📒 ahead of time. Your school probably has a website with supplies lists of syllabi 📄 from the previous year. Use these tools to buy your supplies early and don’t forget to check out my Ultimate School Supplies Haul and Checklist for reference. This is a huge time saver, since stores will be crowded with students after school starts. Therefore, be one step ahead and have your supplies organized and ready. Tip 7: Sleep – If you’re like me, you go on TV and drama marathons 📺💻 during the summer 🌇, so you’re sleep schedule gets pretty messed up. As summer draws close to end, try to adjust in slowly going to bed 😴 as close to your regular school time. Trust me, you will thank me the morning of your first day because you were able to sleep on time the night before. The Night 🌃 Before: OMG, it is the night before the first year of your last four years of primary education. No need to freak and stress out right? This set is the tips about you need to that first day. Tip 8: It is OKAY to feel Freaked-Out 🙈🙉🙊 – Everyone gets nerves, but some are better at concealing it then others. You’ll get adjusted as school continues, and don’t feel weird if you get a little excited. High School is probably going to be full of mixed emotions. Tip 9: Packing – 👎 DON’T, I MEAN SERIOUSLY DO NOT, over pack 🎒. You’re walking🚶around campus the entire day, so pack light and your back and legs will thank you. For light packing, I would suggest a folder and/or binder with pencils and pens ✏️📕✒️📝. THAT’S IT. I wouldn’t start adding all your supplies until you receive your syllabus, which tells you what is required to bring, for each class. Tip 10: Choosing the Right Outfit – When choosing your outfit 👟👕👖👚🎽👗, dress to impress yourself. Yup, it’s as simple as that 👌, when you feel confident, it shows and makes you even more beautiful than you already are. Hint: September is still summer ⛅️ so don’t dress in your fall clothes yet, I would suggest checking the weather so you dress appropriately. The Big Day: It’s here. The day you’ve been dreading 😕 or you’ve been excited 😊 for since summer began. Don’t worry it’s normal to feel both, and here are tips for the first day of high school. Tip 11: Expect the Unexpected – Hey this the first day, so be ready for surprises. Your class schedule could literally change overnight. Remember, sometimes, the first one to two weeks the counselors are still balancing classes and creating schedules. Don’t Panic 😬! Tip 12: Class buddies – Find a friend 👭👬 in each class. Compare schedules with your friends to see if you share any classes. If you’re all alone, don’t worry, meet new people or try to get use to being your own best friend for the time being. Tip 13: Choosing a Hangout on Campus – You and your friends should pick where you meet up for lunch or nutrition break so you guys can spend together if have different classes. Tip 14: A Long Day is Ahead of You. Be Prepared – The first day, always feels the longest ⏰ and is the most overwhelming. This mindset comes from you experiencing new things in an unfamiliar place. Remember the drive to the destination always feels longer than the drive back. Once you gain familiarity in your new school, time will start to go by fast (and sometimes too fast in my opinion). Tip 15: Growing pains are inevitable – The excitement of school quickly dull off (or never existed in the first place), since this is a major steps in your education and life. Everything is really brand new from campus to classrooms and even teachers. You’ll feel lost but just know to ask anyone for help and give it time. Trust me by second semester, you’ll be a pro and know the school inside out. The Week Of: Okay the first day is over… now you just have to survive the rest of the week. This is when the hell of school really begins and we receive the beginning of unending hours of homework and the requirement of studying for exams, and quizzes. Tip 16: HAVE/USE a MAP! – Unless, you have a photographic memory (and those who do, how I envy you) have a copy of your school map and get to know it. This will help you utilize every bit of passing period into getting to your next class and lower the chances in getting lost. Not to mention, it help you feel more confortable around campus and will aid in your adjustment. Tip 17: Know the Dress 👗 Code – Dress to impress yourself, not to distract others. Trust me, especially if your school cracks down on this, you don’t you teacher calling you out and sending you to office for dressing trashy or looking a madame hoochie. My best advice is to dress respectful, classy, and look like your parents 👪 have approval 👍 on what you wear. Tip 18: Don’t be scared to meet new people – Try to be out going and be apart of a variety of social groups. Remember expand your horizons and step out of that comfort zone. Easy ways include talking to those who set next to you in class or joining wide range of clubs. Tip 19: Don’t be superficial or obsess over your image – Dress to impress yourself and get comfortable in what you wear. Don’t like your current style, then change it (You Are Your Own Blank Canvas). Clothes are meant to be a confidence booster and match your personality and/or interests so don’t try to change your image for a friend or popularity. That’s lame and the probability of success is equivalent to 0. Tip 20: Teachers are sometimes either extra nice or mean the first week – For the majority of my teachers, most were understanding of many niners’ first week (given 2 were subs) but one of my teachers seriously tamed our AP Class. They gave us a pop quiz on the first week and since we all literally have nothing in our grade, it ruined our As. This was my first C on a history quiz (hey I made the mistake of studying the wrong map) so there is upcoming post on coping with a bad test score and dealing with parents. Tip 21: Respect all teachers, whether nice or mean – Each of our opinions on our teachers may vary, but no matter what show each one respect as if your parents’ eagle eyes are watching over you. You already have to worry about academics, so you shouldn’t have fear about what citizenship goes your report card as well. Tip 22: No tardies, BE PUNCTUAL ⏰ – Teachers do not like students who are constantly late, so make it a priority to come to class on time or even better early. You never know, some might consider your attendance when considering your citizenship grade. Tip 23: Have a Study Group and Study Buddy Connections – In my opinion, you should have them ready since middle school, but make sure you have buddies ready for each class and one’s you can rely on. Go for the nerds, dorks, and geeks who go to glass, do homework and have passing grades, not your best friend if s/he doesn’t fit these categories. These were first day and week of high school tips and don’t forget P.A.C.E. – Positive Attitude Changes Everything – because the upcoming days are as great you make it. and I hope you will take some of my tips into consideration. Show me how you liked this post by a “like” and I hope you will continue follow-up on my blog. If you have any questions or suggestions, please respond in a comment, and don’t forget to answer my daily poll. I know Words Warrior and I think Arcane Owl. You visited my site on Tuesday, and I wanted to thank you. Are you aware I’m a teacher? I read how you are a student. Thanks again for visiting my site and the kind words about my article and graphic. No I didn’t actually know that you’re a teacher. What’s your grade level? and your posts are as great as always. Thanks so much! 7th grade. Well if you blog as well as you teach, I’m sure your students enjoy having you as a teacher.